Left to right: City of Delaware Attorney Darren Shulman, Baumholder District Mayor Bernd Alsfasser, Public Affairs Officer for the Baumholder Military Community Bernd Mai, and City of Delaware Community Affairs Coordinator Lee Yoakum talk about the relationship between Baumholder and Delaware on the “Delaware City Digest” radio program Friday on WDLR 92.9 FM. Two weeks after a group of city officials made their second trip to Baumholder, Germany, to visit the sister city, the German delegation made the return trip to Delaware for a weeklong stay. The delegation of eight representatives arrived Sept. 29 and departed Saturday after sharing one final meal in Delaware. The connection between the two cities, which was formally recognized as a sister city partnership in 2011, largely stems from the Ohio Wesleyan University men’s soccer team making the trip to Baumholder often since 1990 to play friendly matches. In fact, the delegation was recognized at an OWU soccer game Wednesday evening as part of their day touring and interacting with the campus. In addition to the soccer connection, the U.S. Army has a garrison — USAG Rheinland-Pfalz or “The Rock,” as it is commonly known — located in Baumholder. The U.S. military took over the post in 1951, and it holds the largest concentration of American soldiers outside of the U.S. Colonel Paul Pfahler, a Delaware native, is a former commander of the garrison in Baumholder and also played a significant role in the sister city partnership. During its stay, the German delegation was treated to a pair of Delaware staple restaurants with breakfast at The Hamburger Inn on Oct. 1 and dinner at Bun’s on Friday. Also on Oct. 1, the delegation received a tour of the city, with stops at SourcePoint and Delaware’s Henkel plant. Henkel is a German-owned company with its headquarters located in Düsseldorf, Germany. 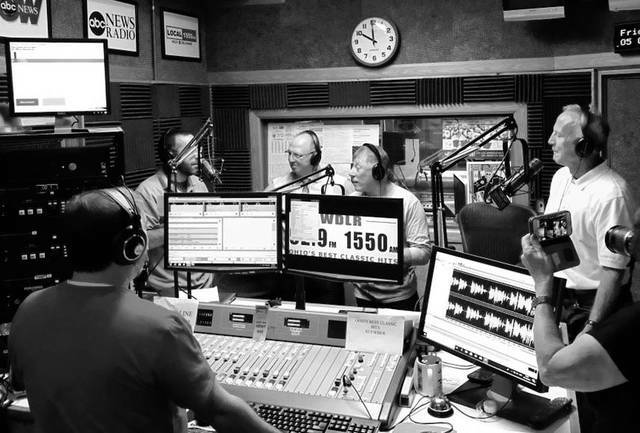 On Friday, the delegation were guests on Yoakum and City Attorney Darren Shulman’s live radio broadcast, “Delaware City Digest,” on WDLR. While the delegation spent a fair amount of time in Delaware, its stay also included experiencing other attractions around the area and state. On Tuesday, they were given a tour of the statehouse and then took a stroll around Columbus’ German Village. Thursday was spent in Cleveland at the Rock and Roll Hall of Fame, and Friday included a tour of the Columbus Zoo. Yoakum said the focus of the Baumholder delegation’s stay was to present a four-fold experience: government, culture, commercial and education. Yoakum said the city was able to accomplish all aspects through a variety of meetings and engagements with different people and entities, such as Burgermeister Bernd Alsfasser accompanying City Manager Tom Homan to a Central Ohio Managers and Mayors Association meeting. “It was an opportunity for our German visitors to see how local government works here and also for (our local government) to hear how local government operates in Baumholder and Germany in general,” Yoakum said. Yoakum added the Baumholder delegation was very interested in learning about the City of Delaware’s water treatment and advancements in nanofiltration that have been made at the water and sewage plants. On the flip side, Delaware officials were able to learn about how Baumholder — and Germany as a whole — approaches solar and wind power and see what opportunities might exist here in Delaware. “It was a wide-ranging visit that touched on a lot of different topics,” Yoakum said.